Many technologists theorize that people will look back on the time-period we are living in now and describe it as a modern Industrial Revolution. Surely the massive expansion of trackable data will create a significant shift in how many aspects of business are approached, and the big tech companies, Apple, Google (Alphabet), Microsoft, Facebook and Amazon, have a huge amount of power in the marketplace because they control the flow of data. They fight to stay ahead, and one-up each and to even disrupt their own business models with newer, more innovative options and opportunities. ‘So, what does this have to do with SEO and Mobile-First Indexing’ you might ask – Actually a lot! For awhile now, Google has been talking about micro-moments. Google describes these as instances where searchers are making a decision about their ultimate goal in a search. According to Google, micro-moments mostly fall into four categories: “I want to know,” “I want to go,” “I want to do” and “I want to buy.” While one entity or topic can easily fit into more than one micro-moment, each of the articles in these series has focused primarily on one of the micro-moments. The first article focused on information search, or “I want to know.” The second article focused on media, which fits with “I want to do,” as in, “I want to watch a video,” I want to play a podcast, “I want to listen to a song.” It could also include, “I want to turn on the lights,” or “I want to cast this image to the TV.” The third article was about shopping, so obviously fits with “I want to buy”. This last article will focus on location and maps, so it is mostly about the “I want to go,” micro-moment, but it also takes a more global perspective, and will discuss how language and location fit into all of the other micro moments. Let’s start with Global location as a concept in search. Historically, different country-versions of Google have operated with different algorithms that were updated at different times. As far as we know, the US algorithm was always the first to receive new updates, and other countries algorithms would be updated later, as Google was able to modify each update to fit the different local and linguistic needs of each country. Google would geo-detect a user’s location, either by the IP block or using other localization signals, and then often redirect the user to the local country version of Google that fit their specific location. As they got more sophisticated, they would geo-locate a person based on the GPS location of their phone to determine which Google ccTLD was most appropriate, and pass that information off to all other logged-in devices. This all changed a few months ago when Google announced that they will now be serving the same algorithmic results from each ccTLD of Google, and that the results would vary instead, based simply on the location of the searcher – So now, theoretically, starting a search on Google.nl is the same as starting a search at Google.com or Google.mx. This may indicate a substantial milestone completion for Mobile-First Indexing and the entity understanding of the web. It makes a lot of sense for Google to leverage the GPS location of a phone in a Mobile-First world, so this should be no surprise. But there are actually a lot of places where language settings can be changed in Google properties, so the increased reliance on these settings as algorithmic variables could complicate the predictability of SEO – something that is fine with Google as long as it also creates good results for searchers. 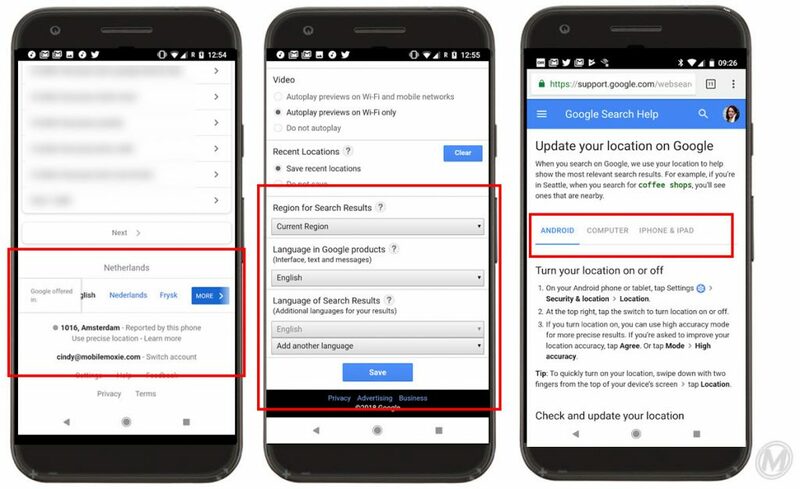 As you can see in the search settings and troubleshooting guide below, Google is getting hints about languages from both Chrome and Android settings, which are not necessarily always in sync. If a search is performed ‘Incognito,’ or the primary phone on the Google Account is turned off, logged-out, or otherwise not giving a good location signal, Google reverts to the IP address, as shown below.This may seem inconsequential, but it is definitely not. The easiest way to understand the long-term potential impact of this change is within Google’s Image Search. Image search has historically been quite disconnected from true user-intent, because it focused on the keyword a user searched for, in the specific language that they searched in – not the actual goal of the search – which was of course, to find a picture of something. In reality, if someone is searching for an image of a ‘blue chair,’ they are searching for a concept, not a keyword. The language that the text surrounding the image is inconsequential. Any pictures of a ‘blue chair’ would be a good result, regardless of the language of the text that the keyword ‘blue chair’ is written in. A search for ‘blauwe stoel’ (Dutch), ‘blauer stuhl’ (German), or ‘青い椅子’ (Japanese) should all return basically the same image results for a blue chair but historically, with the keyword-relevance algorithms, they did not. Now with an index based on entity understanding, along with Google’s translation API’s (already available for many languages) , the intent of the search and the related entity understanding will become much more critical that the un-translated keyword relevance. As expressed in the previous article in this series, most image search results appear to already be derived from the Mobile-First Index. This change to entity understanding is easiest to see with images, because the goal of an image search is visual, and thus, not focused on language or location at all. In a web result, the language matters much more, because the intent would more likely include opening a web page and reading text. The same is true of a voice search, unless we assume that translation APIs would be used to live translate any results for a voice output. This seems unlikely in the short term, especially for long web pages, but potentially much more likely for search results with limited text, such as a Google Action in the near-term. Whenever entity understanding comes up, especially in SEO circles, it ultimately leads you to a conversation about the importance of Schema markup and JSON-LD. These are coded methods of describing the content of a website, app, database, etc., that are easy for search engines to parse and understand. Historically, this type of markup has been used to help companies describe local addresses for maps and provide basic information about recipes, so that Google can show images, calories and cooking times directly in a search result. Schema also helps product pages display star rankings and other great things like that directly in SERPs. What many SEO’s might not realize, is that Schema and JSON-LD are English based codes; so even if they are being used internationally, where content is written in a different language, the markup code is still in English. This makes international entity understanding easier for Google, because it converts the basic information for categorizing entities on websites around the World into English. This is HUGE in terms of potential impacts on international SEO, but also expeditious for Google and entity understanding as a whole. Beyond using Schema and JSON-LD as the Rosetta Stone of the web, English-based entity-understanding has a secondary implication. Google’s most successful search algorithm has always been in English, so when all content is linked together with a unified ‘schema’ for entity understanding, it is easier to have algorithmic searches based on the US/English version of the search algorithm. While the effort to get this all set up and working properly is very large in the beginning, in the long-run, this move could save Google a lot of time and make surfacing search results faster, especially as the content of the web continues to grow at (near) exponential rates. It should get them out of maintaining different versions of the search algorithm for each language and country combination and in the long-run, so most likely it will be even more important for webmasters to mark up their content with the appropriate Schema, when the content is not natively in English. Beyond just Image Search results, entity understanding currently seems to be more prevalent for Google outlets that address entertainment-oriented queries in Google, Google Play and Google Now, as discussed in the second article in this series, but we are also seeing strong examples of entity understanding in Google Shopping and Google Express as well as Google Maps. For all of these topics, language is less relevant or potentially even a hindrance for surfacing what a user wants. For instance, if you are in the Netherlands, searching Google Maps for a ‘grocery store’ in English, your intent and final destination should be the same as if you searched for the Dutch version of the keyword (markt/supermarkt). In fact, using entity understanding in map search solves a huge problem for travelers, because needing to translate a keyword like this into a local language before searching for it in Google (or Google Maps) is a slow and error-prone process. You can already see the beginning of entity understanding in some versions of Google Maps now, with buttons that represent the most common entity searches that Google would like to understand and surface: Restaurant, Grocery Store, Pharmacy, Cafe, Gas Station and ATM, shown below. Notice in the image on the right, that synonyms for the entity understanding of the query are listed with each location that is surfaced, boxed in red. This does not happen in every map query for every entity – it appears to happen only where the entity understanding is strong enough that Google has hit a certain confidence threshold. At this point, ‘supermarket is the only entity that is consistently showing the entity keywords with the specific locations in Map search results. Google seems to be using their AI to build out the entity understanding in Maps over time, so sometimes you can click one of the standard buttons like ‘Pharmacy’ for an entity concept that Google is still learning, and see that the keywords are NOT included, possibly indicating that the confidence in the result or entity understanding is not as strong. 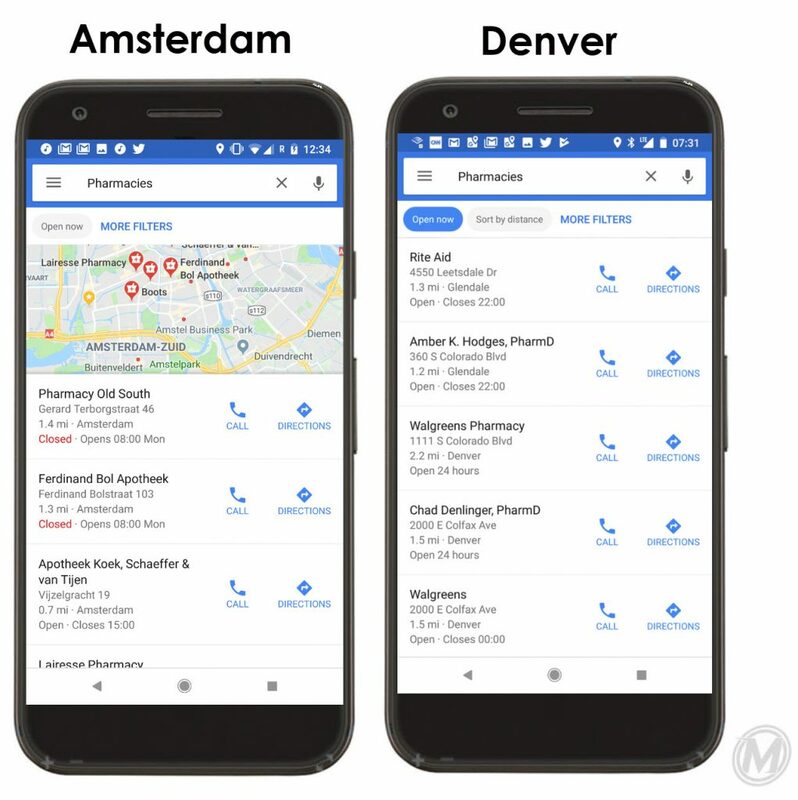 This is important, because some concepts, like ‘pharmacies’ are harder to define, or don’t translate as readily across borders, as illustrated with the Amsterdam and Denver example searches below. In the US, pharmacies like Walgreen’s, CVS and Duane Reed are all-purpose stores where you can pick up prescription drugs, but also many other things including snacks, toiletries and makeup; but in many other countries, including the Netherlands, where one of the example screenshots was taken, pharmacies are much more limited, focusing only on prescription drugs. Google may be trying to disambiguate the query intent, deciding if an American would be just as happy with the Dutch equivalent of a ‘corner store’, ‘convenience store’ or ‘bodega’, even though they clicked on the ‘pharmacy’ button. What is interesting here is that the English understanding in the search from Denver does not appear have entity understanding either, even in the US. This indicates that Google is insisting on multilingual entity understanding in all cases, including in English, where it has the greatest native understanding already, before entities can achieve the same keyword inclusion level of confidence that the Grocery Stores are currently getting. 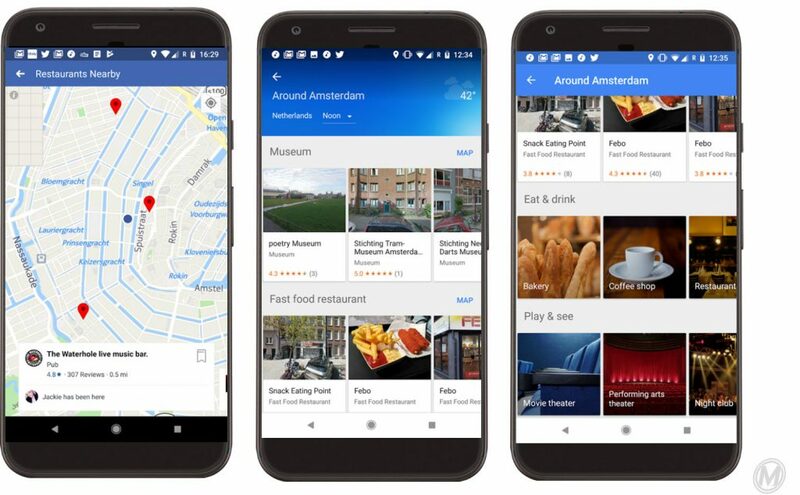 Restaurants and tourist destinations are more universal, so Google’s AI is generally more robust for these types of locations (though there is sometimes confusion with supermarkets that have eat-in delis). 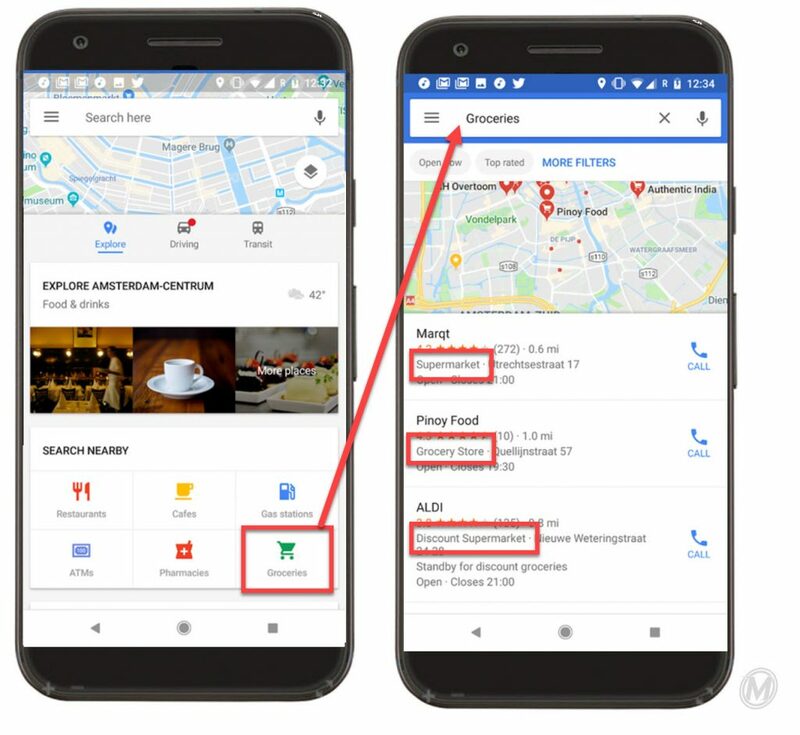 You can see in the image above, that in a Maps browse screen, Google is not only highlighting different types of location-groupings especially for restaurants, but is showing the time of day and weather at the top of the screen, which also impacts the results that are being suggested. It is noon, so we are being shown lunch restaurants, and the weather is cold, but not raining, so outdoor activities are ok, but not preferred. Most likely, these recommendations are based on simple logic like this, as well as crowd-sourced data about what other people have historically chosen to do on days like this. The inclusion of a dynamic (shareable) link that is associated with the map (the three dot, triangular share links), each of the entity results in the map and each of the specific locations suggested in the map should give us a pretty clear idea of how this part of the Mobile-First Index is organized. There are entities, they are grouped, and other entities live within those entities. The entities are more or less relevant to different context, like time of day and weather, and they don’t require unique domains to be surfaced. The dynamic links allow them to be indexed, surfaced and shared without necessarily needing a website or traditional links. This concept will be critical moving forward into the future of Mobile-First Indexing. Rob Thomas, leading software analyst from IBM says that “The rise of the Data Era, coupled with software and connected device sprawl, creates an opportunity for some companies to outperform others. Those who figure out how to apply this advantage will drive unprecedented wealth creation and comprise the new S&P 500.” His prediction is that there will be no more ‘tech companies’ per se, but that all companies will be tech companies by default, and that the tech and the data will be deeply integrated into the fabric of every company. Well-known thought-leader in the technology space, Benidict Evans agrees by saying that simply “It is easier for software to enter other industries than for other industries to hire software people.” I agree and think that there is a big risk that the largest tech companies will invade more industries; empire-building with conquests in the form of M&A in offline sectors; we have seen this already with Amazon’s purchase of WholeFoods grocery store. But it could be more complicated than that; It seems likely that Google sees itself as a potential middle-man and will position itself to help businesses harness the data and stave-off their own wholesale takeover by tech companies in offline industries. 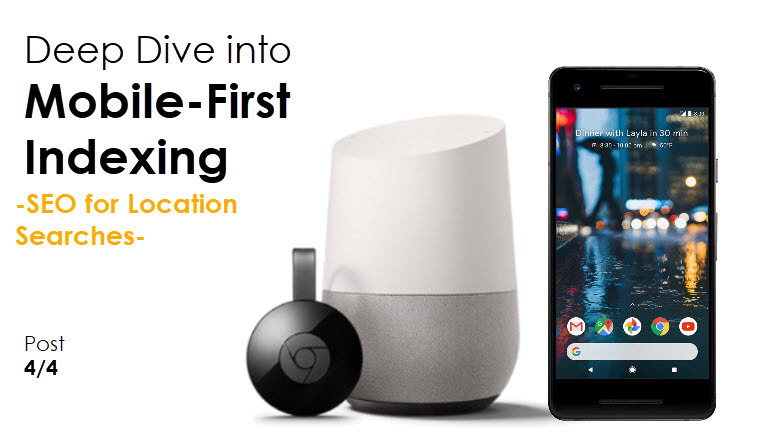 Cross-device, multi-sensor data will be revolutionary, in many ways, and in the long run, it will allow Google to directly index offline goods, further bridging the gap between on and offline information. This will be powerful and revolutionary in its own right. Many online retailers have tried to launch websites tapped into the local store inventory systems, to allow shoppers to find items online and reserve them for pickup in the store, rather than paying for shipping. Target, BestBuy and DSW have all tried, but most encounter significant struggles because current inventory control systems are so bad, Google could easily fix this problem with cheap data sensors. It is possible that Google’s next move will be towards better Just-In-Time (JIT) inventory control systems that help business know the reality of their inventory, rather than simply knowing rough estimates which are only updated every 24 hours, as they do now. Google may also be hedging its long-term bets on their ability to manage fleets of driverless cars, which they have been working on for many years. This would allow them to pull together information from product and inventory-oriented sensors, as well as information about maps, traffic and orders to seamlessly execute Just-in-Time deliveries for all kinds of stores, with maximal efficiency and minimal incremental cost. The new expectation will be set, where potential customers can order something that they are interested in, have it delivered in 24 hours, and return it in the next 24 hours if it does not meet their expectations, all using the internet, without leaving their house. No more waiting in line or trying things on in store dressing rooms. Similarly, grocery delivery apps have been around for a number of years, but none of the stores made it easy enough to casually add things to the list or place orders. Being able to update a weekly grocery list using just your voice may change all that. When voice search is combined with AI, cloud data and mapping or potentially even driverless cars for Just-in-Time delivery services, we get something that Google would really be interested in. Looking into the future, if Google’s ultimate goal is to use sensors to help companies index offline inventory for Just-in-Time delivery, potentially using fleets of Google’s driverless cars, the long-term result of Mobile-First Indexing could ultimately help smaller, more local businesses, empowering small-scale retailers to compete more directly with the large, enterprise e-commerce sites. The model might help people easily get food that is locally grown, or organic and in-season, delivered on a regular basis without the markup that is associated with most retail stores; small start-ups could spend the money they would have invested in the physical store on inventory planning and order management systems. Shopping may resume a local focus, leveraging the internet to compete with the larger, global retailers and this would fit well with the direction of society, the demands of Millennials, and Google’s goals to reach the next Million Users. Is this A Whole New Google? Unsurprisingly, Fuschia focuses heavily on Entity understanding. From his review of the Fuschia documentation, Kyle suggests that “Entities are created and shared in JSON, a format which is designed to be human-readable and is nearly universal with parsing available in most modern programming languages. We also briefly learned last week, that Ledger [individualized Google device software that enables quick task and device switching for one user] is also designed to handle JSON objects well. This is certainly no coincidence. Ledger will almost certainly directly keep track of entities, among its other duties …. Improved Dynamic Entity Extraction: The new entity extractor adds support for Microdata and listens for mutation events so that entities can be re-scraped. When the entities in the page change an event is triggered and the web view updates the context store’s list of entities.” This all fits extremely well with how we have described Mobile-First Indexing’s heavy reliance on JSON markup and other methods of entity understanding for dynamic presentation of data and on-going AI. Additionally, for another indication of the good fit with Mobile-First Indexing, Kyle explains that Fuchsia leans heavily on Android Instant Apps. “Android Instant Apps allow users to try out new apps before committing to install. To do this though, developers have to create a specially-made and stripped-down modular app using the Instant Apps SDK. Where Fuchsia differs however, is that there is seemingly no distinction between an installed app and an “Instant” version. Whether you install it manually or run instantly from a suggestion, the app is the same… The most important thing though, is that these processes will be completely transparent. It looks like Google is building Fuchsia so that when users know what they want to do next, Fuchsia will be happy to accommodate. You won’t have to worry about whether or not you have the app you want installed, saving you from filling your devices with apps you “might need someday.” If Fuchsia is a success, this could be monumental change for SEO and progress for entity understanding and Google’s AI. Traditional ASO will fall into the past and be replaced with context-aware surfacing of Instant Apps. From a more pragmatic, and immediate SEO perspective, Fuchsia is still important. 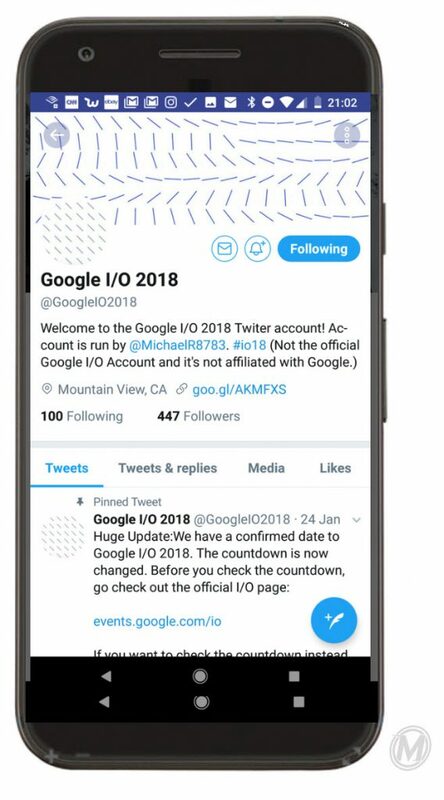 Remember that the Google’s “Speed” updates is set to launch ‘this July’ and the update to fix the problematic cached AMP URLs slated to launch ‘sometime in the middle of the Summer,’ so these both could be timed to coincide with a more full-throated launch of Mobile-First Indexing at Google I/O. Beyond that, we have already seen movements in the Chrome browser announcements that fit well with Mobile-First Indexing, and with a unified browser-OS, like what is being tested with Fuchsia: Chrome will not have a visible address bar, which is important if it is launching content without URLs, and for PWAs launching full-screen; Chrome will focus more on offline caching, important if it is running as both OS and browser); Chrome will auto-adjust for zooming in DevTools; if they can do it in DevTools, they can do it elsewhere, and this is an important feature for any OS-browser combo that might work on a non-standard device display, like on TV and car displays) and Chrome will focus much more on HTTPS, which is very important if it is running as both OS and browser. In the same way that ‘tech’ may no-longer be as relevant or descriptive of a classification for any company, ‘the internet’ may no-longer be as relevant of a concept for where people spend their time, money and attention. It will just be a necessary part of the equation that will fade into the background and become a ‘given’ or a ‘constant’. Access to high-tech data processing and analysis on the internet will become analogous to having access to a unique skill, material or machine needed in the previous century. This is going a long way to break down barriers, and from the perspective of SEO, the most important barrier that is being broken down is a linguistic one. Mobile-First Indexing, and entity understanding, along with translation APIs is allowing Google to index the world based on a single set of ideas, which will speed up the organizing and surfacing of information, and help expedite the management of algorithms. It will also make international AI and machine learning for voice search more robust and meaningful much faster, with more data feeding the same system, instead of having the systems all segmented by country or language. Technology has driven us to a new ‘on-demand’ economy, but the newest, most innovative opportunity might actually be the one that is closest to home. On-demand goods and services that are organized and ordered on the internet, but then appear nearly immediately, might be the next big thing. The concept of tech companies using ubiquitous cross-device internet, data and sensors to radically change non-tech industries and the concept of a Mobile-First Index could go hand-in-hand, especially if indexing of offline products and inventory becomes a reality. When searchers seek out these goods and services, their end goal is not the website, but the good or service. The prospect of Fuchsia could be huge, both for Mobile-First Indexing, but also AI and the Internet of Things. If it is a success, it will fundamentally change the job of marketers and SEO’s, hopefully for the better. 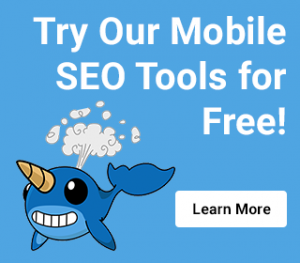 Unfortunately, marketers have gotten so used to marketing on the website or in the physical store that they can’t imagine their jobs without those options, but Mobile-First Indexing could help make this part of the new reality. This is the fourth and final article in a series about Mobile-First Indexing. It explained how the entity understanding described previous articles, which focused on information searches, media searches and shopping searches come together globally, and how that will change SEO in the long run. Finally, it also covered how this change to Mobile-First Indexing may indicate, at least from an SEO perspective, that soon we really may be dealing with a whole new Google. 2. Though Google uses a mobile devices location to determine language when showing search results, they soon announced that the same algorithms will be applied to ccTLDs (top level domains). 3. Schema and JSON-LD are universally written in English which allows any international languages easier for Google to understand and thus surfacing results faster. 4. 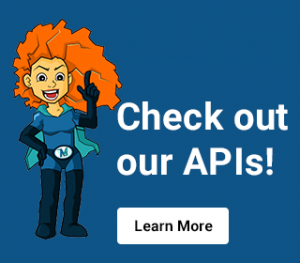 We’re seeing entity understanding implemented across many applications (Google Shopping, Google Express and Google Maps) that’s allowing a faster user experience than having to translate across languages. 5. Cross device, multi-sensory data will be revolutionary -especially in the indexing of offline goods. Given the current poor control systems, many online retailers have tried to launch websites tapped into the local store inventory systems but are struggling to provide real-time accuracy. 6. Expect a whole new Google with the release of Fuchsia (Googles new cross-device, OS-browser combo) that will fit seamlessly into Mobile-First Indexing. This is part of the ultimate goal of unifying the browser, OS, and app stores. 7. New technology has moved consumers to a new “on-demand” economy and could be the next big thing. The indexing of offline products into an online environment could go hand in hand with the Mobile-First Index. This is where consumers don’t necessarily want the website, but the good/service. Please Read All Articles in this Series! Article 1/4: Is Mobile-First the Same as Voice-First?